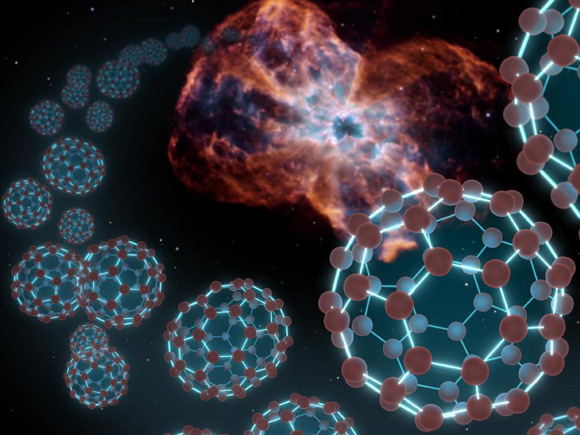 NASA's Spitzer Space Telescope has sniffed out Carbon-60 molecules in a distant nebula - the first detection of "Buckyballs" in outer space. A team led by astronomer Jan Cami of the University of Western Ontario, Canada, and the SETI Institute, unexpectedly spotted the miniature footballs in planetary nebula dubbed Tc 1. A white dwarf at the nebula's heart illuminates material it has shed during its lifetime, and in that cloud are Buckyballs - "perhaps reflecting a short stage in the star's life, when it sloughs off a puff of material rich in carbon", as NASA puts it. Cami enthused: "We found what are now the largest molecules known to exist in space. We are particularly excited because they have unique properties that make them important players for all sorts of physical and chemical processes going on in space." 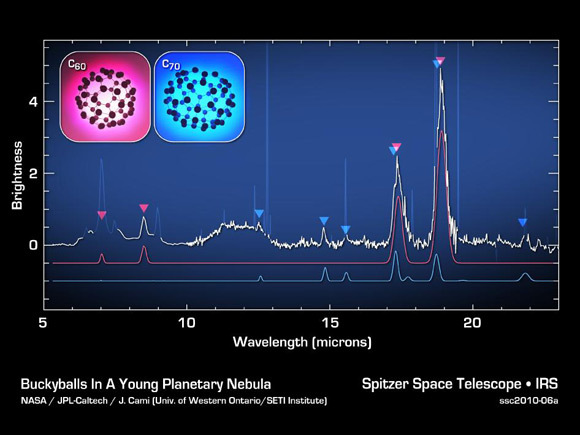 Spitzer's spectroscopy instrument made the breakthrough discovery, delivering the Buckyballs' spectral signatures. Comparison with lab data on Carbon-60 confirmed a match. Buckyballs are, of course, named in honour of Buckminster Fuller's geodesic domes, although their 60-atom lattice perhaps merits the moniker "Footyballs". Carbon-60 was first predicted in 1970 by professor Eiji Osawa of the Toyohashi University of Technology. It wasn't observed until 1985 when Bob Curl, Harry Kroto and Rick Smalley created it in the lab by firing a laser at a graphite disk during an experiment to simulate the process by which carbon clusters might be produced in a red giant’s atmosphere. Buckyballs and other fullerenes have since been found to exist in nature, notably in candle soot. Curl, Kroto and Smalley secured the 1996 Nobel Prize for chemistry for their work. Kroto said of the Spitzer spot: "This most exciting breakthrough provides convincing evidence that the Buckyball has, as I long suspected, existed since time immemorial in the dark recesses of our galaxy." NASA's caption says: "Buckyballs jiggle, or vibrate, in a variety of ways - 174 ways to be exact. Four of these vibrational modes cause the molecules to either absorb or emit infrared light. All four modes were detected by Spitzer. "The space telescope first gathered light from the area around the dying star - specifically a region rich in carbon - then, with the help of its spectrograph instrument, spread the light into its various components, or wavelengths. "Astronomers studied the data, a spectrum like the one shown here, to identify signatures, or fingerprints, of molecules. The four vibrational modes of Buckyballs are indicated by the red arrows. Likewise, Spitzer identified four vibrational modes of C70, shown by the blue arrows."